GP Greencell. 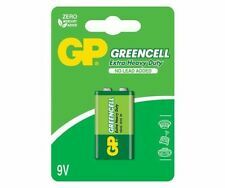 1 piece 9V GP greencell. No lead Added. Extra Heavy Duty. 9V (square battery). Coin/Button Cell Sub-Type Square Battery. Features Extra Heavy Duty. Type 9 V Block. Product Weight : 40 grams. GP Greencell. 4 piece 1.5V GP greencell AA R6. No lead Added. Extra Heavy Duty. GP Greencell. 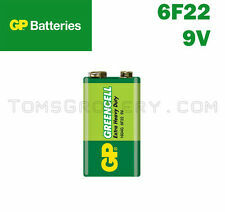 8 piece 1.5V GP greencell AA R6. No lead Added. Extra Heavy Duty. 1604GLF 6F22. GP Extra Heavy Duty 9V battery x 1 pc. GP Greencell. 1 piece 9V GP greencell. No lead Added. Extra Heavy Duty. Other Information. 100% Brand New, New in packing Original GP Products. GP Greencell, Extra Heavy Duty Battery 9v Type PP3, 1604AU, 6LF22, 6LR61, MN1604 Short-Circuit Proof For detail, please visit: Package includes: (with original packaging) GP 9v Battery x1 Brand GP Type PP3 Voltage 9v Chemical Composition Alkaline UPC 4891199015540 MPN Does not apply. 9V, PP3, LR22, MN1604, BLOC, E-BLOC, 6LR61, 1604AU, X22, 1604, 1604A, 1604AC, 4022, 522, 6AM6, 6F22, 9VOLT, A1604, CLR6, K9V, KA9, ND65V, R22, RB100893. 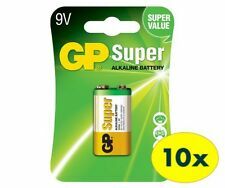 Choose GP Alkaline Super 9V batteries . Type Alkaline. 8 pieces 9V GP Ultra 9V 6F22. Alkaline batteries. Other Information. 9V, PP3, LR22, MN1604, BLOC, E-BLOC, 6LR61, 1604AU, X22, 1604, 1604A, 1604AC, 4022, 522, 6AM6, 6F22, 9VOLT, A1604, CLR6, K9V, KA9, ND65V, R22, RB100893. 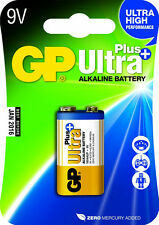 Choose GP Alkaline Ultra Plus 9V batteries . 10 x GP Greencell 9V Block 1604G 6F22 6LR61. Extra Heavy Duty Battery. Food & beverages. 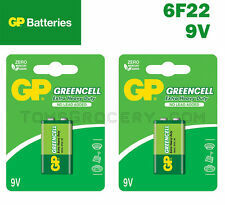 2 x GP Greencell 9V Block 1604G 6F22 6LR61. Extra Heavy Duty Battery. Food & beverages. 100% Brand New, New in packing, Made in Malaysia Original GP Products (GP1604AU-SS1) Zero Mercury and Cadmium GP Ultra, Extra Heavy Duty Battery 9v Type PP3, 1604AU, 6LF22, 6LR61, MN1604 Short-Circuit Proof Package includes: (with original packaging) GP 9v Alkaline Battery x10pcs (in one box) Brand GP Type PP3 Voltage 9v Chemical Composition Alkaline UPC 4891199034688 MPN GP1604AU. 5 x GP Greencell 9V Block 1604G 6F22 6LR61. Extra Heavy Duty Battery. Food & beverages. 3 x GP Greencell 9V Block 1604G 6F22 6LR61. Extra Heavy Duty Battery. Food & beverages. 4 x GP Greencell 9V Block 1604G 6F22 6LR61. Extra Heavy Duty Battery. Food & beverages. GP Super Alkaline 6LR61/9V battery BL185. Characteristics : 9V / 6LR61. Format / Size: 9V / 6LR61 / 6LF22 / 6LP3146 / 6AM6 / MN1604 / E-Block / Transistor. GP Super Alkaline. Blister with 1 battery. Full range of battery sizes. 1604GLF 6F22. GP Extra Heavy Duty 9V battery x 10 pcs. GP Greencell 9V Block 1604G 6F22 6LR61. Extra Heavy Duty Battery. Food & beverages. 9V, PP3, LR22, MN1604, BLOC, E-BLOC, 6LR61, 1604AU, X22, 1604, 1604A, 1604AC, 4022, 522, 6AM6, 6F22, 9VOLT, A1604, CLR6, K9V, KA9, ND65V, R22, RB100893. 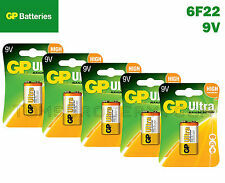 Choose GP Alkaline Ultra 9V batteries . Type Alkaline. 100% Brand New, New in packing Original GP Products. 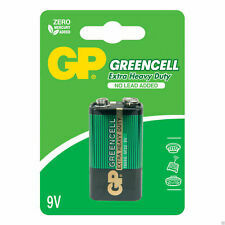 GP Greencell, Extra Heavy Duty Battery 9v Type PP3, 1604AU, 6LF22, 6LR61, MN1604 Short-Circuit Proof For detail, please visit: Package includes: (with original packaging) GP 9v Battery x10pcs (in one box) Brand GP Type PP3 Voltage 9v Chemical Composition Alkaline UPC 4891199015540 UPC Does not apply MPN Does not apply. PP3 1604AU 6F22 6LR61 200mAh. Expiration date: 2023. GP ULTRA Alkaline 9V Block Battery. GP Ultra Alkaline is especially designed for the most popular portable electronic devices. Shelf life up to 7 years.